At 34 years old, Ivan Medina is an illustrator and graphic designer from Honduras living in New York City whose career has spanned two continents. He left Honduras for one important reason–he had to hide who he was. Medina has been reclaiming his pride since he moved to New York City. In New York, he has grown more and more comfortable with being his true self around both his loved ones and strangers. He has built better relationships and grown to be happier because he finally feels comfortable with being a gay man in an accepting society. This piece expresses how the artist interprets the feeling of being comfortable with who you really are. Dare to be yourself and the rest will follow. Strip yourself of every pretense and just go out and show your true self to the world – that’s how you reclaim your pride. The black and white background symbolizes how being an immigrant is not easy right now during this particular political climate. Everywhere you go you are bombarded with negative messages from the media. It is unsettling. The only thing that keeps me going is the fact that every time I step outside my apartment I can go out and present myself exactly the way I am–no pretenses and no masks. That is why I wanted to paint a naked figure wearing bright red pumps giving homage to one of my favorite stories, The Wizard of Oz . New York City is my home now, and I feel like there is no place like this one where I can go out and feel mentally naked around everybody. 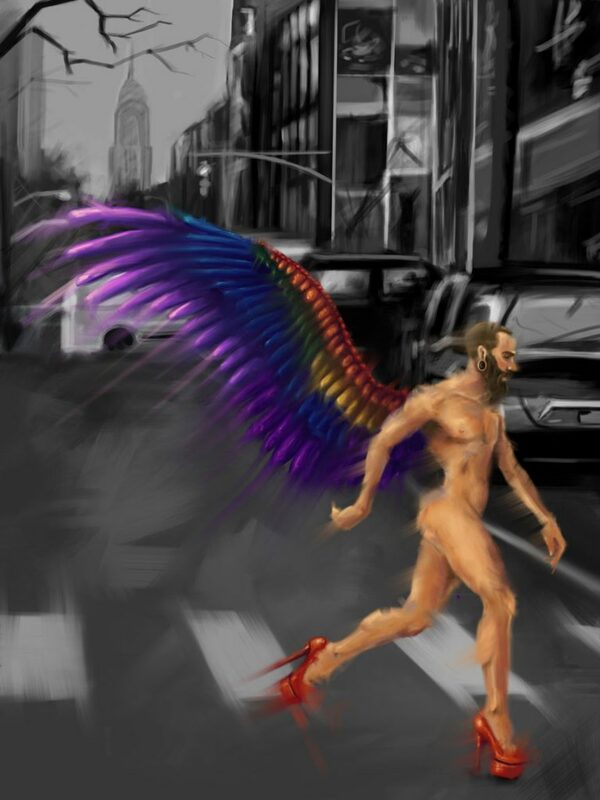 Here I am able to walk completely free with my wings displaying every color of my personality and the pride I feel in being a gay man. Visit Ivan Medina’s website to see more of his work.